Henry is making a miraculous recovery. 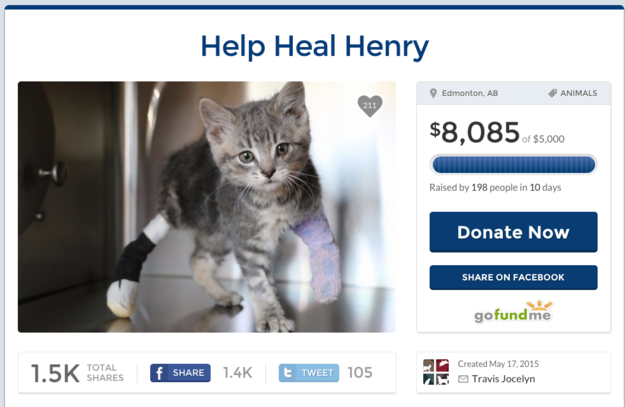 Henry the kitten is making an impressive recovery after being hit by a vehicle in Red Deer, Alberta. He now sports the most adorable cast. “I didn’t think he was going to make it,” Mariah Berini from the Edmonton Humane Society told the Edmonton Journal. “He was unresponsive when he was brought in. He was just hanging on. A GoFundMe campaign to pay for his care raised more than $8,000. There’s also now a long list of people who want to adopt him. But Henry’s not quite ready to go home with someone yet. “He has a long way to go before he is completely healthy,” said Sue O’Connor of the humane society. Meanwhile, Henry the miracle cat is basking in the love and attention.